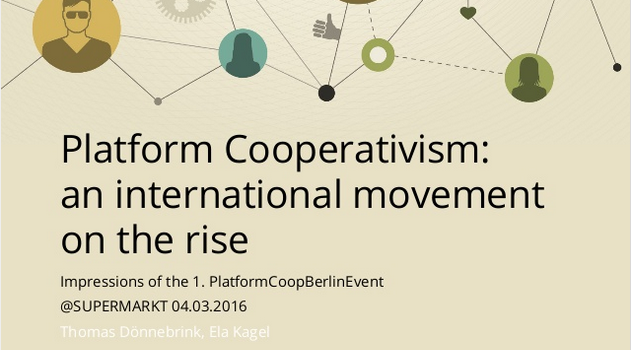 This PlatformCoopBerlin report by Thomas Dönnebrink and Ela Kagel comprises an introduction into the notion of platform cooperativism, references and links to main activists, activities and further readings. You’ll also find a report on the first #platformCoopBerlin meet-up in Berlin on the 04.03.2016, including a transcript of Michel Bauwen’s speech at this gathering. This article might be useful for whoever wants to get a basic or better understanding of platform cooperativism. People intending to organise a #PlatformCoopX meetup in their own city or researching about the subject will also find helpful information, links and contacts.